This simply precious organic diaper cake is the perfect gift for baby shower or new baby. Included are 35 organic diapers topped with super soft organic giraffe rattle by Baby GUND and luxuriously wrapped with embroidered organic blanket, organic bodysuit, organic pants and organic bib all made from 100% organic cotton that is soft and gentle on baby's skin. 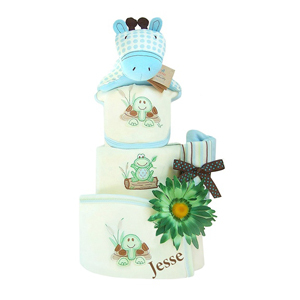 The blue frog design is so cute and perfect for a newborn! The rattle on top is very soft and great for baby to sleep with. Blanket can be embroidered with baby's name for an extra special touch. Simply adorable, this sweet diaper cake also makes a great baby shower gift or centerpiece! All comes beautifully packaged in clear shrink wrap for secure shipping and wrapped in fabulous white tulle and matching bow for an extra special touch.